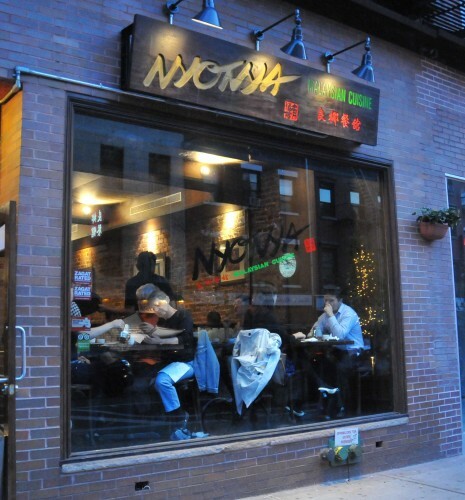 Nyonya is the bustling, busy and extremely popular Malaysian restaurant in Little Italy. Here they try to bring to the West authentic Nyonya style cooking which evolved as result of the intermarriages between Chinese immigrants and local Malays. The food at Nyonya is good but the whole experience is all a little too mass for me. I feel Im missing out on the authentic nuances of the cuisine which I might experience at a place likeTaste Good. This is one my favorite appetizers. I always measure how good a Malaysian restaurant is based on how much I enjoy this dish. 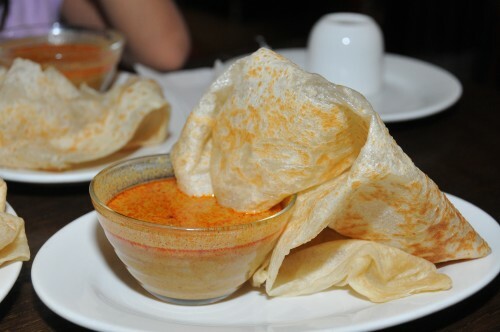 I thought the curry that came with the roti’s was excellent – some of the best I’ve treid but the Roti cannai was a little too limp. I felt it should have been crispier so that when you dip it in the curry, it softens just a little but still gives you a little crunch when you bite into it. 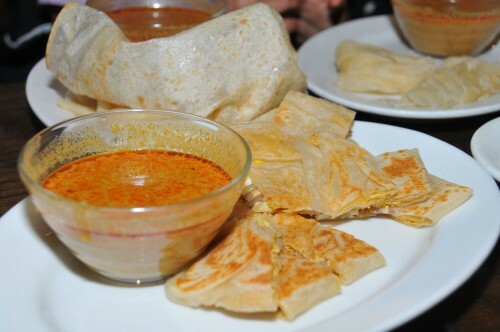 The roti telur which is made with the same dough as the canai is a roti that is filled with egg. It was very good. Their chicken satay was very good. The meat was tender and the marinade was tasty. 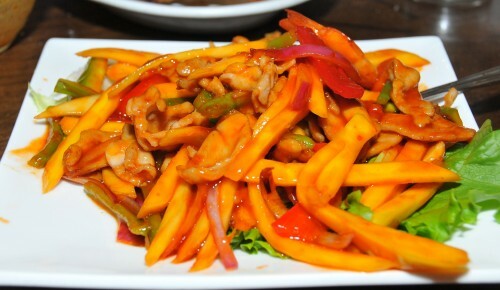 This is a tangy dish made with tender slices of chicken, shrimp and mango slices. It had a great balance between sweet and sour. 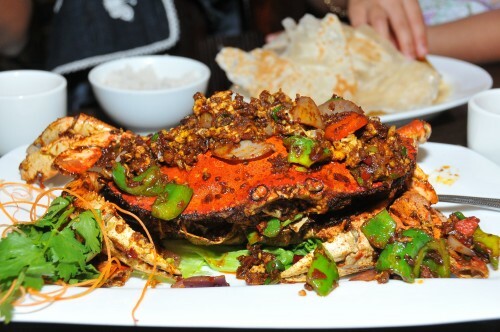 I wanted something spicy so I ordered the chili crab. It was not spicy but it was good. The crab was fresh, it was well cooked and it was covered in a dry sauce with crunchy fresh, peppers and onions. This entry was posted in Little Italy, MALAYSIAN, MANHATTAN and tagged best malaysian food in new york, best roti telur in new york, food reviews for Nyonya, good Malaysian food in nyc, great malaysian food in new york city, Malaysian food in new york city, Malaysian lower east side, Nyonya, Nyonya cuisine, Nyonya in nyc, Nyonya reviews, reviews for Nyonya. Bookmark the permalink. That roti looks good… even if a bit on the limp side, it must’ve soaked up the curry better that way!